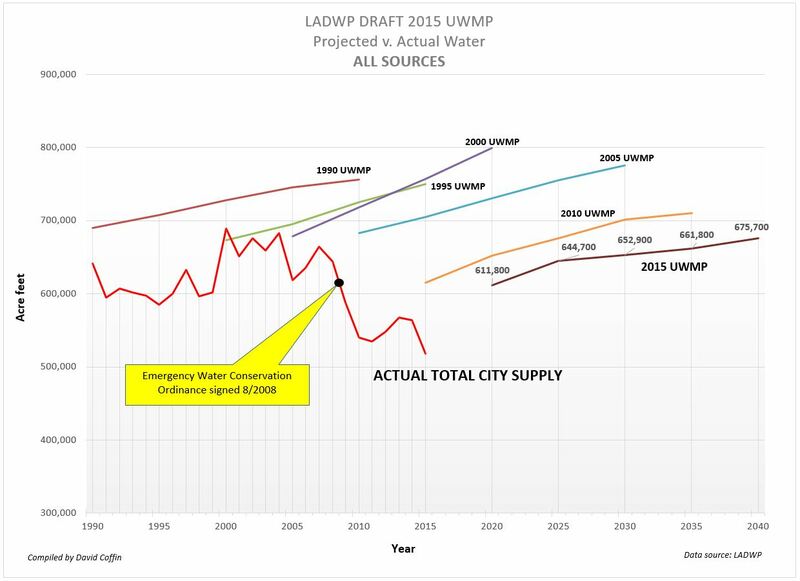 After spending a few weeks paging through the just released LADWP 2015 Draft Urban Water Management Plan, my immediate conclusion is that the plan is a thinly disguised effort to hide the city’s low water supply levels from the planning process to protect development. This draft, like past UWMP’s, continues to project levels of water in all supply categories that the department does not have access to and it continues to assert access to water in categories that aren’t really a supply such as Conservation and Harvesting. 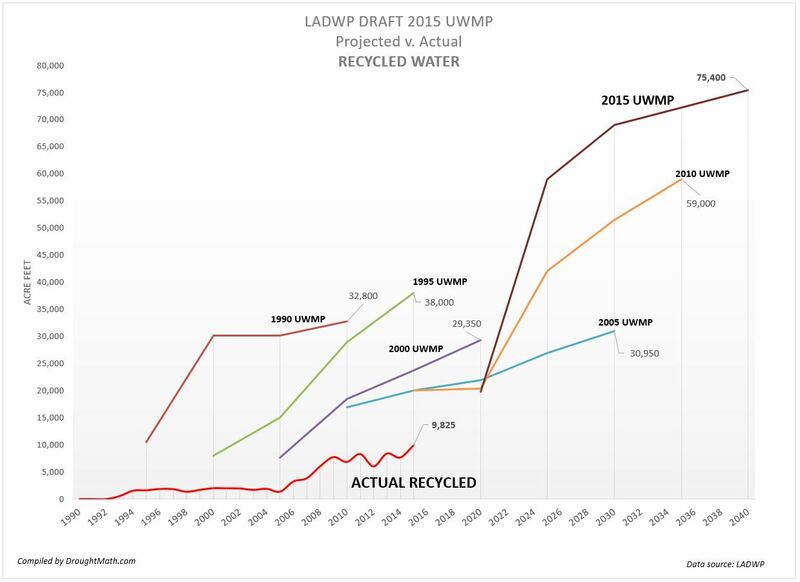 California law requires that utilities update the UWMP every five years to demonstrate long term water supply availability before approving new projects. This task has become tougher to prove as the regions grow and various interests throughout the state assert their rights to the state’s water supply. The department compounds the problem even further when it reports to planners and developers that there is sufficient water for growth despite the shortage. In 2010 the LADWP found that totaling up aqueduct, groundwater, recycled water and MWD water was no longer adding up to the total supplies it needed to show as evidence of sufficient growth. To solve this problem, it began to look for new ways to produce water. Some categories were real such as stormwater capture and indirect potable reuse but other categories were simply fuzzy water meant to artificially raise the total supply using paper water. The following is a line by line look at the supply projections in the draft's Service Area Reliability Assessments table. I’ll show where the real water is and what’s vulnerable to challenge. I’m going to be blunt. Conservation is not a supply. Conservation should be used to lower the baseline demand and from there, the department should demonstrate how it will meet that. However, the department uses Conservation as a supply to merely to bump up the total supply figures shown in the Service Area Reliability Assessment tables to present a UWMP that's favorable to planning documents. The department’s 2015 draft shows Conservation as an existing or planned supply that will contribute up to 125,800 Af/y to the city’s water portfolio. But simply put, this is ‘paper water’. This is done to hide a portion of the total shortfall the department doesn’t want seen in Environmental Impact Reports that are attached to projects for review by the planning department. There is a simple test to see if Conservation (or any other category of water) is real water or imaginary water. The 2009 California Water Plan Update describes ‘paper water’ as water that “utilities claim they have access to, but is difficult or impossible to access for various reasons”. Using that definition in our test, if we eliminate all of the city’s real incoming sources of water such as the aqueduct, groundwater, recycled water, stormwater, and MWD water, and leave the city with only Conservation, how much water would the city have access to and available to use? None. The leftover 125,800 AF of 'water' the LADWP claims it has access to is not accessible. You can’t wash your hands with this water and you cannot sip it from a glass. Consequently, it's paper water and not a supply. 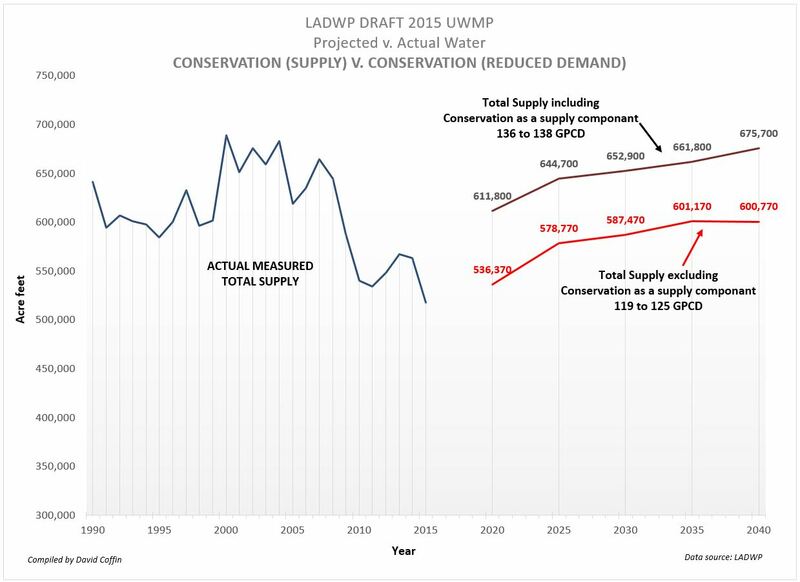 Asserting that ‘Conservation’ is a water supply allows the department to manipulate the UWMP's supply projections, making it appear that the city’s total available supply will be 611,800 Af/y in 2020 and grow as high as 675,700 Af/y by the year 2040. However, when we remove this imaginary water from the table, the departments total projections fall to a dismal 536,370 Af/y and over time it grows to just 600,770 AF/y by 2040. This is would fall more in line with the city’s historical supply. I’m sure the department sees another benefit to asserting that Conservation is a supply. It doesn’t have to report the actual results like it does with real water from the aqueduct, groundwater, MWD, and recycled water which are all measured as they enter the water system. Prior to 2010, the city had always deducted conservation savings from the baseline demand side and calculated the required supply from there. If it did this here, the projections would be in the range of 536,370 to 600,770 AF/y. The department would then have to provide a plan to explain how it will get the city to reduce its per capita supply from 130 gallons per day to just 95 gallons per day. The next supply item in the planned supply table is the Los Angeles Aqueduct. Sadly, the LADWP no longer finds William Mulholland’s engineering marvel worthy of top billing anymore. Instead it appears that the department wants optics on something called ‘Conservation’ in the UWMP even though that’s not real water like the aqueduct. It’s important to note that the Los Angeles Aqueduct continues to be the city’s largest owned producer of water in the city’s supply portfolio. 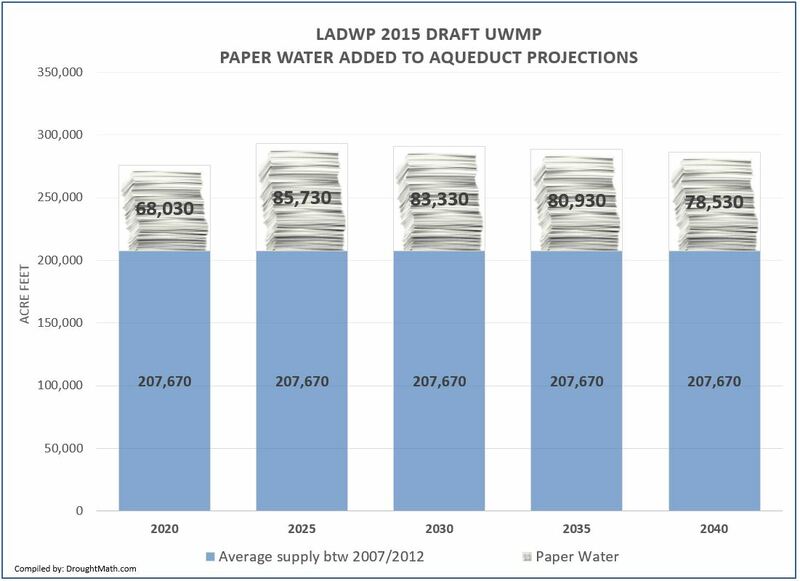 This item in the Draft 2015 UWMP uses paper water in the Los Angeles Aqueduct projections to hide 68,030 to 85,730 AF/y of the city’s total supply shortage. The draft does this by seriously over estimating how much water is available through the aqueduct. There is no reason to believe that future aqueduct supplies will average higher than 227,000 Af/y even if the department is able to lower the amount of water needed to mitigate Owens Basin dust levels. The next major source of water supply and third on the list is Groundwater. Like every UWMP before it, the Draft 2015 UWMP continues citing far more access to groundwater than the department really has access to. 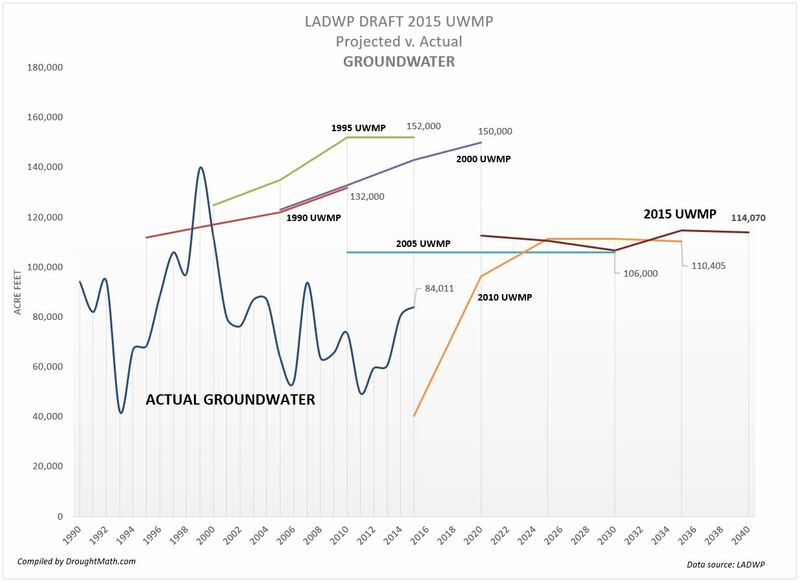 This conclusion is made by comparing the actual measured groundwater supply that has averaged just 74,390 AF/y between 2000 and 2015 with the departments Draft 2015 UWMP projections of 112,670 to 114,070 AF/y. Anything more than 74,390 AF/y is paper water which is used to bump up the total supply and hide the departments shortage in planning documents. From a historical perspective, there is simply no evidence that the department will meet the projections they cite in the current draft. Claims of over 100,000 AF/y have been made in every iteration of the departments UWMP since 1985. 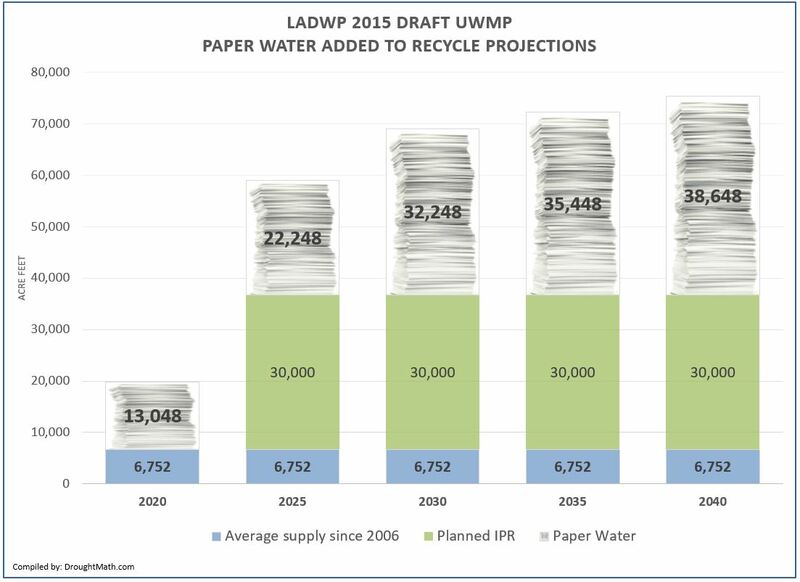 Recycled water is next in the planned supply table in the Draft 2015 UWMP. The department split Recycled water is split between two sub categories back in 2010 and that continues today. They are ‘Irrigation and Industrial Use’ and ‘Groundwater Replenishment’. Irrigation and Industrial Use, better known as purple pipe is expected to contribute 19,800 AF/y of water into the city water system by 2020 and increase to 45,400 AF/y by 2040. However, the departments history of meeting purple pipe projections suggests that they will not come close to meeting these new projections either. Over the last eight years the department’s average has been just ~7,500 AF/y. EIR’s produced between 2010 and 2015 have all claimed that by 2015, water recycled and distributed through purple pipe would be contributing 20,000 Af/y into the city’s water system. However, the department missed that mark badly with only ~9,800 AF of measured supply by September of 2015. Earlier UWMP’s promised even more water, citing that up to 29,000 AF/y would have been available by 2015. 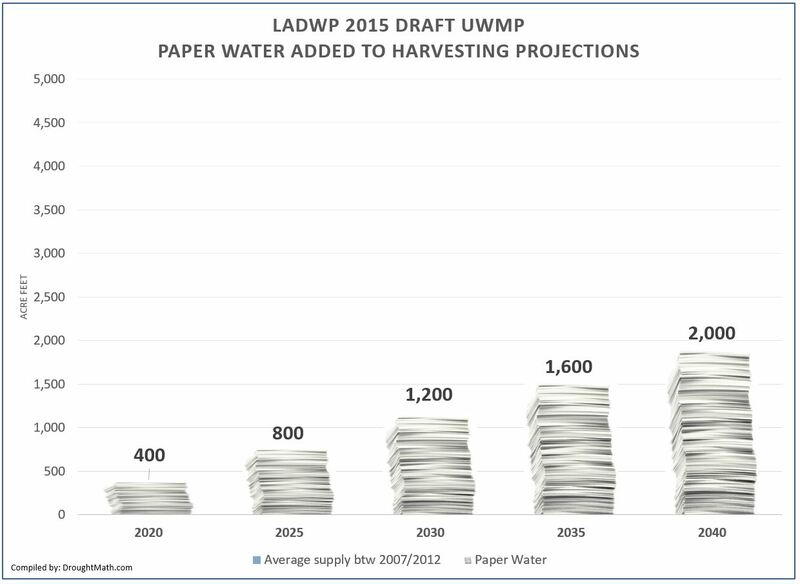 Even given the chance that the LADWP might eke out at least 15,000 AF/y of purple pipe water, the Draft 2015 UWMP is effectively be hiding up to 30,400 AF/y of the city’s total supply shortage using paper water in this particular category. Our fifth line of the planned supply table is Groundwater Replenishment. This is not expected to begin contributing the city’s water portfolio until 2025. Groundwater Replenishment is a treated wastewater program known as Indirect Potable Reuse which is similar to Orange County’s successful IPR program. If the department is successful at rolling out IPR, this may turn out to be a real supply. How much we actually see entering the system on a year to year basis remains to be seen. What was new to the 2010 UWMP but considered only a ‘potential supply’, Stormwater Capture has been undeservingly upgraded to a ‘planned supply’. It is split between two line items, Stormwater ‘Reuse’ and Stormwater ‘Recharge’. Stormwater Reused is the sixth supply line item in the planned supply table. Also known as Capture and Reuse or Harvesting, it is another fuzzy water category consisting of Rain Barrels and Cisterns. The department claims that these components will be contributing to 400 AF/y to the city’s water system by 2020 and that will increase to 2,000 AF/y by 2040. 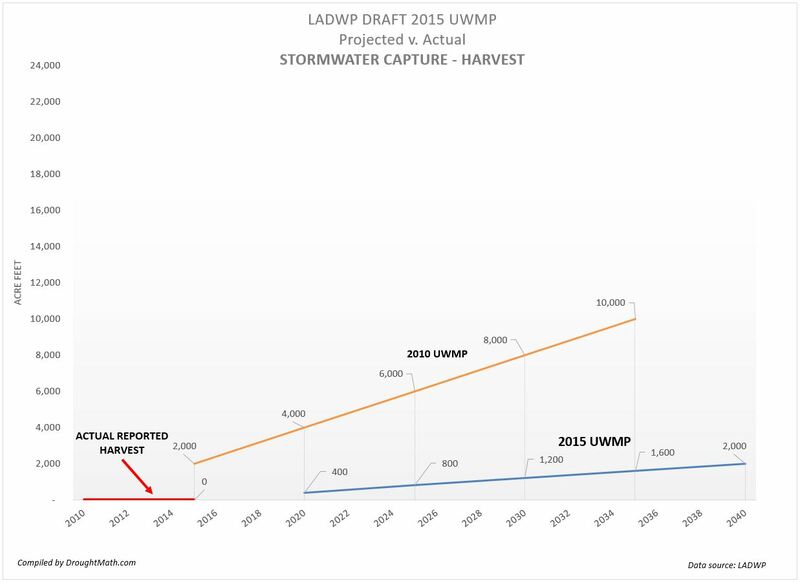 In the previous 6 years, the 2010 UWMP asserted that Harvesting would contribute 2,000 to 10,000 AF/y of water into the city’s water supply portfolio but none of that was ever reported. Development projects throughout the city parroted that claim in their EIR’s but the department could never measure it nor report it. 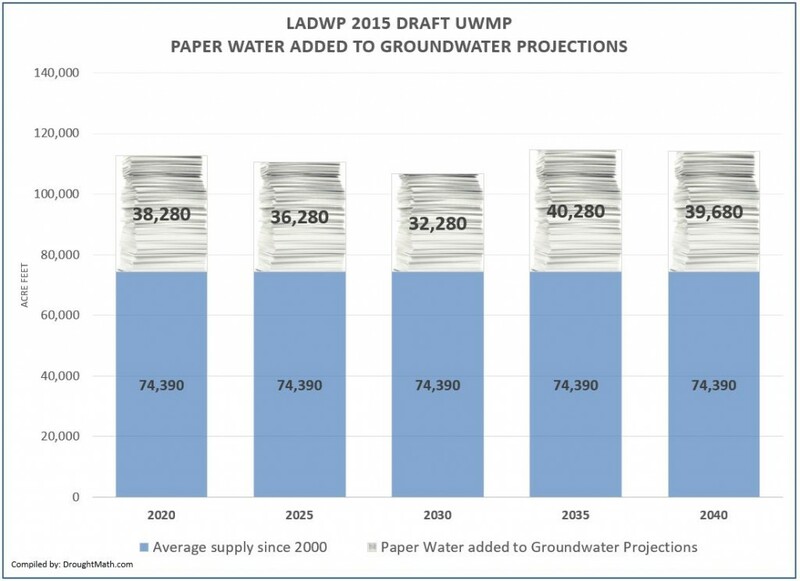 Whether it’s the 2010 UWMP or the 2015 plan, this category fits the definition of paper water because the department has no direct access to it. Rain barrels and cisterns are back yard, privately owned containers that do not have gages mounted to them that report back to the utility. There is no way the LADWP can tell if they are actually in use, whether they’ve collected rainwater or if they have been repurposed for other uses. I get the sense that they are keeping this category around mainly so that they can give away rain barrels to promote the conservation. The Draft 2015 UWMP uses paper water in the Stormwater Reuse category to hide 400 to 2,000 AF/y of the city’s total supply shortage. The seventh line item of the UWMP planned supply table is ‘Recharge’. Over the years the city has relied on ‘natural recharge’ but this has severely decreased due to the city’s urbanization because as structures and roads were built over permeable soil. The intent is to build an infrastructure that will capture up to 15,000 AF/y of water during intense rainwater events and allow it to infiltrate into to the ground much like natural recharge. This may very well be another form of supply that is difficult to access given that is relies on rain events. For example, El Nino was thought that it would bring heavy rains to the Los Angeles area in the Winter/Spring of 2016 but that did not happen. Recharge will be subject to the same meteorological events that groundwater pumping relies on and as noted earlier, groundwater pumping has never met the long term projections found in past UWMPs. There is no guarantee that it will result in 15,000 Af/y supply until the program is in fully implemented and effects can be measured as it enters the city’s water system. How much we actually see entering the system on a year to year basis remains to be seen. ‘MWD Water Purchases’ is an interesting category because the department has consistently ‘underestimated’ how much it will buy from the Metropolitan Water District. This happens because as previously noted, the LADWP claims it has access to water it doesn’t have access to. Sooner or later the department has to quietly make adjustments and purchase additional water from the MWD to make up for the shortage. The 2015 projections are pretty stunning given that it represents a 68% drop from the 2010 UWMP and worse, an 80% drop from the real purchases. 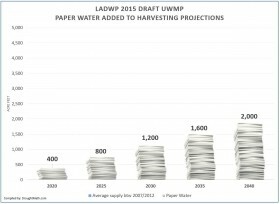 Given how much paper water is in this draft UWMP which includes the so-called ‘Conservation’, there is no evidence that the LADWP will be able to meet those projections and subsequently limit MWD purchases at this level unless Mayor Garcetti wants to deliberately deepen the city’s water supply shortage by plunging the city into a Phase IV or Phase V restrictions. 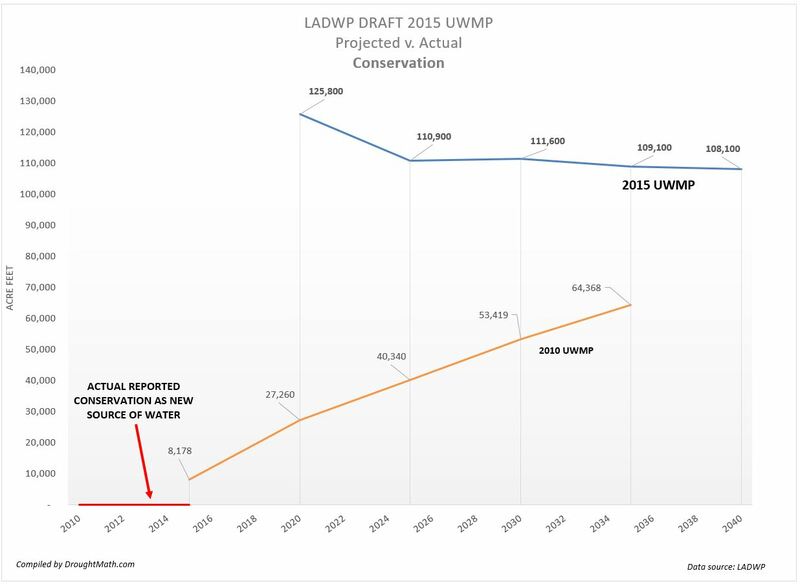 Between 2000 to 2010, the LADWP projected it would be purchasing an average of 247,995 AF/y from the MWD. But during this time the actual average supply it purchased from the MWD during that time was 30% higher at 325,570 AF/y. 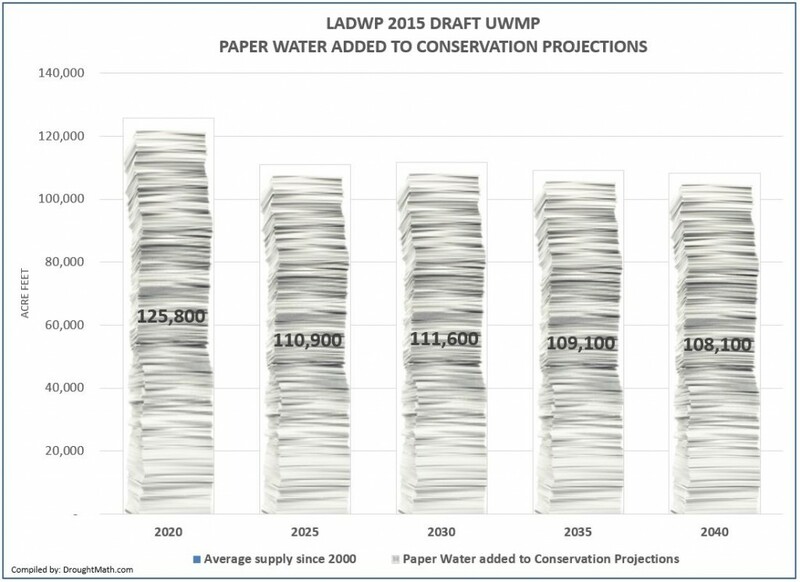 This clearly demonstrates that the LADWP has not been meeting its real water projections and that its projections are indeed full of paper water. 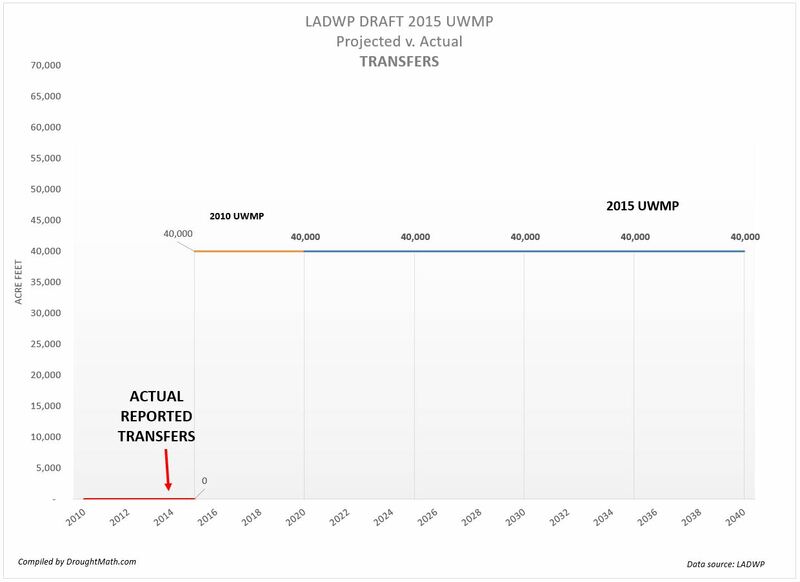 The department’s MWD projections are simply not reliable. Over the last six years, projects working their way through the planning process cited in their EIR’s that 40,000 AF/y of Transfer water would be available to the city by 2015 along with other surplus water in the other categories. However, the department was not able to access this water that so we can firmly place this in the category of paper water. With the water market turning increasingly bleak, the LADWP rightfully did not include Transfers in the Service Area Reliability Assessments table as a ‘Planned Supply’. Instead it downgraded Transfers to a ‘Potential Supply’ but it still remains on the Service Area Reliability Assessments table making it ‘appear’ as if it is accessible. The chances that the department will have access to this water is fairly remote given that there no willing sellers in the Central Valley or Northern California and its like that the department would find itself bidding against the well-financed Metropolitan Water District. The $40 million spent by the LADWP on the Neenach Pumping Station Turnout Facility Project in the Antelope Valley doesn’t seem like a great investment today. 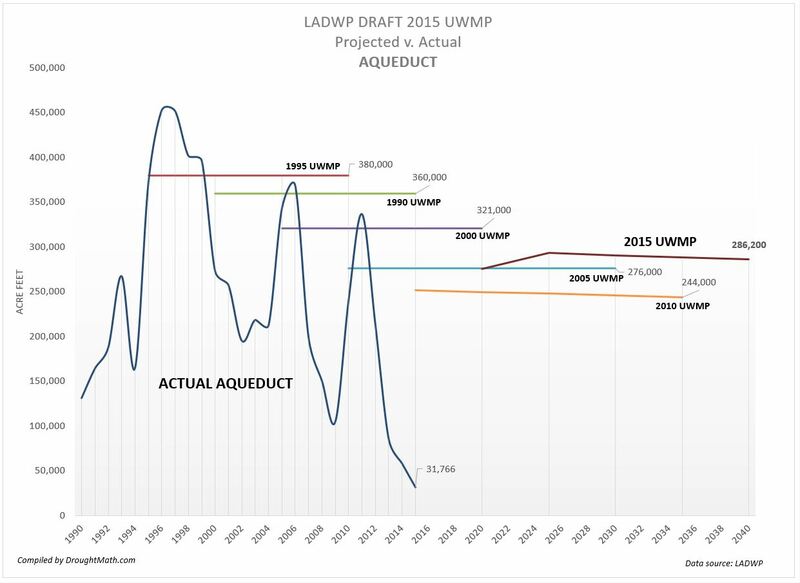 The tenth and last item in the Draft 2015 UWMP Services Area Reliability Assessment is an alternative MWD Water Purchase should the LADWP be able to secure contracts for water in the ‘Transfer’ category. It states that if the LADWP were to be able to secure contracts for 40,000 AF/y of Transfer water, this would result in lower MWD purchases amounting to ~20,630 to 35,430 AF/y. LADWP water plans are generally more about perception than results and 'Purple Pipe' is certainly the poster child proving that. 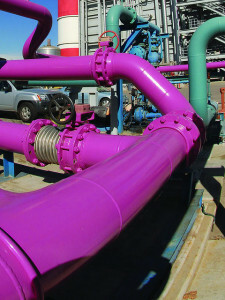 Purple pipe is used to distribute non-potable recycled water and is often presented as one of the departments cornerstone resources to meeting the city's water supply demand since it frees up potable water that would have been used for irrigation or industrial use. Thumb through many of the DWP’s presentations and you'll find impressive glossy photos of purple pipe that suggest that it's been making big contributions to increasing the City of Los Angeles water supply. Even the Mayor and the city’s neighborhood councils are lulled into this group think. However when perception meets gritty reality, purple pipes contribution to the city's water supply is simply underwhelming and not deserving of so much attention. 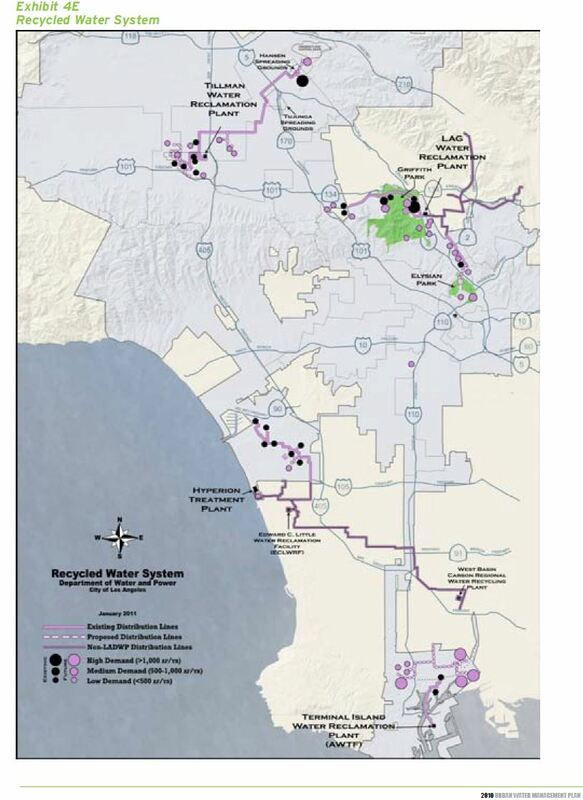 Past LADWP water plans told us recycled water was supposed to deliver be delivering ~30,000 Af/y to the city by 2015. But instead the city's been getting an average of only 7,600 Af/y. There are several reasons for this shortfall, the biggest being the same reason the city isn’t able to effectively replace its aging water mains. The immense cost of such an effort and the disruptive nature of digging up thousands of miles of city streets in a city that is already built out and paved over is prohibitive. The department says it would take 300 years to replace its crumbling water mains. Building a distribution network of purple pipe runs into the same problems of cost and disruption. This leaves the department to choose routes where it can get the most bang for its buck. Generally this means it has to be a customer who can use lots of recycled water and is relatively near by the filtering plant. In the city's west side for example, only a few customers like LAX, Westchester Golf Course, Loyola Marymount and Playa Vista fall into that category. Sure it would be nice to have purple pipe running alongside the city's water mains that finally connects up to every large commercial and residential complex but that's not going to happen. The other reason for the lack of progress is that recycled water is primarily for irrigation and industrial use. In the 1980's the city's industrial use was ~30,000 Af/y but overtime this has fallen to an average of just 19,000 Af/y. The rest would go to city parks, golf courses and new commercial/residential developments that are close enough to filtering plants that makes it economically viable to tear out a few streets and lay new purple pipe. This is not a growing customer segment that justifies the departments claim that it will increase recycled water to 42,000 Af/y by 2025 and 59,000 Af/y by 2035.